Matthew is a graduate in Art History (Edinburgh) and Fine Art (Glasgow School of Art). He joined VocalEyes in 2015, having worked for many years at the British Museum, as an editor, digital content manager and then head of the web team, responsible for the museum’s websites and digital projects, including gallery and mobile technology projects. Prior to that he worked at the Victoria and Albert Museum as a curatorial assistant, working on documentation, gallery and other projects across many of the curatorial departments. Since 2008, Matthew has been a Trustee of the Jodi Mattes Trust, that champions accessibility of digital culture in the museums, libraries and archive sectors through the biennial Jodi Awards. Michael has a BA (Hons) in Drama from Goldsmith’s College and an MA in Text and Performance from King’s College, London and RADA. As a writer he has had the radio play Glass broadcast on Wired FM in London, the double bill Family Business/Deadly Play produced at the Onion Shed, London and two sketches in a revue at the Edinburgh Fringe Festival. Michael has also worked in film and TV production: Fairytale: A True Story (Icon productions), Distant Bridges (Sunfly Pictures), Emmerdale (ITV) and Focus North (Channel 4). From 2000 until 2003 he worked as an intern then literary assistant at the Public Theater in New York, before becoming Literary Manager from 2003-2005. Michael has been running VocalEyes’ Theatre Programme since 2006. Anna is a museum professional with broad experience across the sector in exhibitions and interpretation. Prior to joining VocalEyes in 2016 she held posts at the V&A, White Lodge Museum at The Royal Ballet School, Arnolfini, and the University of Bristol Theatre Collection. She has a wide educational background that includes a BA in Social Psychology from the University of Sussex, a PGCE from Durham University, and an MA in Art Gallery & Museum Studies from the University of Manchester. Anna takes an audience-focused approach, and is dedicated to exploring creative ways to support broader access to museums, and increased enjoyment of their sites and collections. Charlie joined VocalEyes in January 2019 after 11 years at RNIB as a campaigner and advice professional, supporting people with sight loss to access information and services. She studied Critical Fine Art Practice at the University of Brighton and is passionate about supporting visually impaired people to access the arts. She is looking forward to supporting many more people to enjoy the arts in the UK. Marina has a BA (Hons) in Art History from Complutense University Madrid and an MA in Cultural and Postcolonial Studies from Goldsmith’s College. Prior to working at VocalEyes, she worked in international aid and the arts sector, working at art fairs, galleries and cultural spaces in London and Madrid. Ali trained as an audio describer in 2008 as part of the See a Voice project and works as a freelance describer with VocalEyes and independently. She has a master’s degree in applied theatre from Royal Central School of Speech and Drama and worked as a director, actor and trainer in theatre and education in the Middle and Far East for many years. Since returning to the UK she founded Dramatic Results (formerly Stop Gap Theatre). As director, she designs and delivers tailor made forum drama workshops for business, the public sector and community organisations working in close cooperation with clients in the public and private sector. She also creates issue-based performances for conferences and road shows and provides one-to-one performance coaching. A freelance writer and describer, Andrew works in theatre, the visual arts and the heritage sector. Andrew co-founded VocalEyes and was one of the original team of professional describers at the National Theatre. He has described plays in venues throughout England and written audio tours for major museums and galleries including the V&A, the Natural History Museum and Tate Britain. As a trainer he has worked for the National Theatre, for VocalEyes, and for the Audio Description Association. Internationally he has spoken at a number of conferences and trained describers in Hong Kong and Portugal. Over the last few years he has been working with The Central Library for Blind and Reading Impaired People, helping to set up an audio description service in Israel. His play “The road without earth’s road dust” was shortlisted for the Papatango Prize in 2015. Anne is one of the country’s leading audio describers and has worked with VocalEyes since its inception. She established audio description at the Octagon Theatre in Bolton in the late 1980s and went on to launch her own company Mind’s Eye in the early 1990s. She is an accredited Audio Description Trainer and is on the Executive of the Audio Description Association. Anne has had a parallel career in Marketing and Audience Development in the Arts and was the editor of the Arts Council publication Action for Access. Bridget started out life as a dancer and actor, specialising in actors’ movement and dance. She has recently been working on a variety of special projects for visually impaired people of all ages in museums and galleries including Tate St. Ives, the Courtauld Galleries and the V&A. Bridget is also part of the audio describer team at the Royal National Theatre. She also writes children’s novels including Step Into the Dark, Feast of Fools and Ship’s Angel. Clare trained as an actor and stage manager at East 15 Acting School and Goldsmiths College in London, and worked for many years in theatre. She has been describing for VocalEyes since 1999, and provides access and audio description training at museums, galleries and heritage sites. She also writes audio description for television and cinema, as well as fiction and screen plays. Eleanor has been describing theatre and dance since 2003. She also enjoys writing guides for museums and galleries, and live architectural tours. Innovative approaches to audio description are a particular interest, drawing on her research into how elements such as sound and touch contribute to the experience of performance. Her other work as a writer and theatre researcher ranges from creative writing workshops in galleries to guided walks, and from archival research to model-making. Jane enjoys a challenge, and since qualifying as a describer with VocalEyes in 1999, she’s worked all over the UK on a wide range of plays, operas, films and television programmes, not to mention circus and street festivals. Particular highlights have been disability arts festivals and working with children. She also enjoys leading architecture tours for VocalEyes at the annual Open House London. Currently she works in a range of theatres, independently and for Vocaleyes, and prepares and presents audio introductions for Sightlines at the Royal Opera House and English National Opera. With a background in broadcasting, she enjoys recording and editing as well as writing descriptions. Jenny studied Drama and Irish Studies at the University of Surrey. She then went on to train as an actor at The Academy of Live and Recorded Arts. She has worked as a professional actor for five years and it was during that time that she trained at The Royal National Theatre to be an audio describer. She was delighted to be asked to join VocalEyes and continues to find the work challenging and enjoyable. Joanna Myers trained at the London Academy of Music and Dramatic Art and has enjoyed 18 years as an actress in theatre, TV, radio and voice work, training with VocalEyes in 1999. Since then she has audio described numerous productions around UK – plays, pantos, musicals, ballet, circus and live street festival entertainment. For RNIB she has described films and recorded books, and spent 5 years describing film and TV for ITFC. She has also been involved with a number of creative/access projects including A Sense of Place and Information Age for the Science Museum. Jonathan currently works as a full time audio-describer for all genres of live performance, specialising in Opera and Ballet. Having worked in the arts since the age of sixteen, Jonathan’s roles have covered many different aspects of the industry from stage crew to opera singer, Box Office Manager, and Front-of-House Manager, through to Corporate Project Management and Rock and Pop. Jonathan originally trained as an audio describer in 1993, and was one of the founding describers for VocalEyes, He is co-founder of Sightlines Audio Description Services working in both London and across regional theatres in both England and Wales. Jonathan lives in Somerset with his husband Daniel. Julia has worked as an audio describer for about 10 years, having been trained initially by the Royal Shakespeare Company. She finds working as an audio describer immensely challenging and rewarding as it allows her to combine her love of the theatre with the opportunity to make it more accessible. Apart from being an audio describer, Julia works part-time at Warwick University cataloguing rare books, and most of the rest of her time is taken with her family. Kate Taylor-Davies spent several years solely as an actor and singer after graduating from UWA, before falling into (and in love with) the world of voice-over. In 2011, she was trained as an audio describer by Clare Le May as part of an Access project by Curve Theatre, Leicester. Since then, she has described plays in both London, where she is based, her native Leicester, and site-centric promenade theatre on the South Coast. Her repertoire spans musicals, films, sitcoms and cartoons, including Elena of Avalor, Good Luck Charlie, Phineas and Ferb, Their Finest, Under The Shadow, A Bigger Splash! and the documentary, Life Animated. She holds drama workshops having worked with YESS and Creative Wellbeing and is currently recording and writing vocals and music as a collaboration with artist, “Glow”. Kerry is a former English teacher and actor with a passion for words and storytelling. She trained in 2009 as part of the See A Voice project and has since worked across the country on a variety of productions. Highlights include The Railway Children at Waterloo station in 2010, which featured a live steam engine, and a promenade performance of Twelfth Night which involved talking a group through a forest from a distant location! In 2013 she was awarded the Guildford Mayor’s Award for Access in the Arts for her site-specific programme of work with Guildford Shakespeare Company. Kerry particularly enjoys touch tours, bringing the space to life with energy and language. She continues to perform as voice artist and singer and can occasionally be heard on Radio 4 as a contributor to Poetry Please, The Food Programme and Natural Histories. Kirin has been working in the disability sector since 1990 and in 1999 obtained an MA in human resources at Northumbria University. She is also a professional actor trained through Graeae Theatre Company and London Metropolitan University. She has toured with Extant, Britain’s leading professional performing arts company of visually impaired people, both in the UK and Europe. She also continues to work in the disability sector supporting disabled people to seek work and live their lives independently through a variety of projects. She has worked with VocalEyes for over 7 years including the See-a-Voice project. Kirin is based in Scotland and is on ADA Scotland‘s committee. Kirin is an avid user of audio description in theatres, museums, galleries, heritage sites and cinemas and hopes that one day access provision will be the norm for all blind and partially sighted people. Kirstin Smith trained as an audio describer with the See-a-Voice project in 2009 and has since described plays and performances for theatres across the UK. Kirstin has written and edited several descriptive guides for museums including work for the Imperial War Museum, Science Museum and St Paul’s. She is also an experienced trainer for museum and gallery staff. Kirstin is a Lecturer in Drama at the University of East Anglia. Lonny has been working as an Audio Describer since 2000 when she trained at the ITFC. She is passionate about making arts and culture accessible for blind and partially sighted people and has worked in all areas of Audio Description including: screen, theatre, architecture, museums and heritage Sites. She works for the RNIB as an Audio Description Trainer and has been with VocalEyes since 2007. Some of the venues that Lonny has worked with are the V&A Museum of Childhood, Royal Court Theatre, Oxford Museums, Shakespeare’s Globe, the British Museum, Lewes Castle, Towner Art Gallery and Open House London. Louise Fryer has been an audio describer for VocalEyes since it was founded, describing theatre, opera and dance. She also works with galleries to help make their collections more accessible. She is one of the National Theatre’s AD team, and has described films and TV. She was the accessibility consultant and audio describer for the acclaimed screen version of John Hull’s Notes on Blindness. Louise has trained stage and screen describers in the UK and Australia, and is a Lecturer in Audiovisual Translation at University College London. She has a PhD in psychology exploring the impact of visual impairment on media engagement. Her book An Introduction to Audio Description: A Practical Guide was published by Routledge in 2016 . Louise is also a regular broadcaster for BBC Radio 3. Miranda started to work for VocalEyes in 2004. She currently works as Access Officer at the Almeida Theatre and was trained as a describer for Greenwich Theatre by VocalEyes in 2003. Miranda originally trained as an actress, then went into musical theatre and session singing work. Since about 2001 she has been writing her own songs and hopes one day to develop this side of things much further. More recently much of her time is devoted to being with her family and newborn son. Nadine has been a Chartered Physiotherapist for many years, running her own private practice and later managing an NHS outpatient department. She currently works part time specialising in joint replacements, general orthopaedics and cardiac surgery. Her love of theatre began as a child and she has spent many years directing, writing for and acting in plays. She spent twelve years teaching voice production and performance techniques and during this time, in 2011, was trained as an audio describer by Clare Le May as part of an Access project by the recently opened Curve Theatre, Leicester. Since then she has described plays in London, Leicester, Promenade Theatre on the South Coast, musicals, and museum projects for children. She particularly enjoys working with young patrons as they bring new and exciting challenges and fresh language. Pippa is a Premier Dancer with Northern Ballet. She trained at The Hammond School and The Royal Ballet Upper School. In a career that spans over two decades, Pippa has performed nationally and internationally with Northern Ballet as well as, Scottish Ballet, Weiner Ballet and The Royal Ballet. Alongside her performances, she coaches, guest teaches and delivers Insight workshops to blind and visually impaired patrons. Pippa was trained and mentored for audio description by Bridget Crowley and has been working with VocalEyes since 2017. Ruth James trained with Vocaleyes Describers Louise Fryer and Clare LeMay in 2007. She has worked on a fascinating variety of theatre productions since then – from one man drag cabaret to more traditional theatre – and in very different venues – from tiny studios to large theatres. Ruth still works as an actor and singer, and relishes the excitement of making theatre vivid through audio description. Sally Booth joined VocalEyes’ team of freelance trainers in 2015. She is a practising artist who has exhibited her work at Tate Modern, Whitechapel Art Gallery, South Bank Centre, the Scottish Parliament and the Bluecoat in Liverpool. As a visually impaired artist, Sally brings a creative approach to her work, curating exhibitions, running workshops with disabled participants, and working with galleries and museums to develop more inclusive services. Sally was the first individual artist to receive a Jodi Award for accessible digital technology for her own website. Sally has a background in arts project management and gallery education. Her experience has included working as Arts Development Manager for Shape Arts, a leading disability arts charity. Sally’s access consultancy work has included being an assessor for the Jodi Awards, which promote excellence in access to digital media; RNIB/VocalEyes Talking Images project; and access adviser for the 24-hour design challenges at the Royal College of Art, and an associate for Earnscliffe Making Access Work. 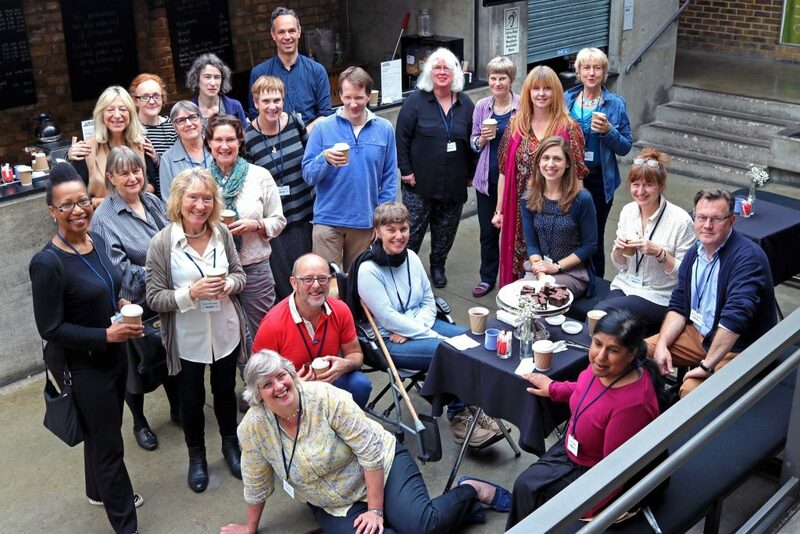 Sally has been a member of the Tate Modern Access group since 2000. Simon studied dance at the Arts Educational School and Royal Ballet, Upper School. He danced professionally with English National Ballet for 5 years and Rambert Dance Company for 12 years. He has been involved with VocalEyes since 2015 and has been mentored for audio description by Bridget Crowley. Tony has been audio describing with VocalEyes for six years. He has very much enjoyed being involved with the company from the beginning and getting to meet the regular and growing number of service users over the years. As well as working with VocalEyes, Tony also works as a Theatre Director and Drama Practitioner. He specialises in working with marginalized groups, exploring ways of making theatre and the theatre-making process accessible to all. When not working, Tony enjoys seeing even more theatre, cinema, keeping healthy through swimming and yoga and escaping London in search of fresh air and a view. Veronika Hyks has been involved in the development of audio description across the media since 1992, but with a particular focus on film and TV as a practitioner, trainer, academic tutor and consumer analyst. She has described over 800 feature films and documentaries, as well as over 3000 hours of prime-time TV narration for BBC, ITV, Channel Four and Five & satellite and corporate productions – including Emmy-award-winning People’s Century, Timewatch, Horizon, Inside Story, Airline, Timeshift, Edwardians in Colour JL Piper Roscars 2011, Fit Club Panorama 2018. Veronika has worked as a freelance audio describer with VocalEyes since 2004. Willie Elliott first started working as an audio describer in 2001 with Graeae Theatre Company in their production of ‘The Changeling’. He has worked on a wide variety of events from opera, ballet and drama to circus and live street events, such as the Liberty and Greenwich and Docklands International Festival. In 2012 Willie co-described the opening ceremony of the Paralympic Games on television. This was the first time a live event was audio described on an open television channel in the UK. In the same period, he described two productions connected with the Cultural Olympiad; ‘Breathe’, celebrated the opening of the sailing event in Weymouth and ‘Resonance at the Still Point of Change’, a song cycle, performed at the Queen Elizabeth Hall on London’s South Bank. 2014 brought the opening and closing ceremonies for the Sochi Winter Paralympics in March, described live online. For two years running, he described at Impulzdance, international dance festival in Vienna. Willie is part of the description team at the Royal National Theatre in London and works alongside Sightlines, providing introductory audio notes for the Royal Opera House, Royal Ballet and The English National Opera, as well as being audio description consultant for Diverse City, who perform large-scale outdoor circus pieces, featuring performers with different bodies. Zoe Partington is a contemporary artist, who uses her installations to develop viscerally-powerful audio visual and tactile representations of disabled people’s journeys and experiences through spaces. She predominantly works as a creative consultant and trainer for the cultural sector, as well as a researcher, auditor and creative equality trainer for museums and galleries to develop their skills and experience for meeting the needs of disabled visitors. Zoe has worked as a visual awareness trainer for VocalEyes since 2016.